IMCDb.org: 1980 Iveco 6640 G in "T.I.R., 1984-1985"
I thought this might've been that amphibious Jeep that circumnavigated the world and ended up in the Guiness Book of World Records. 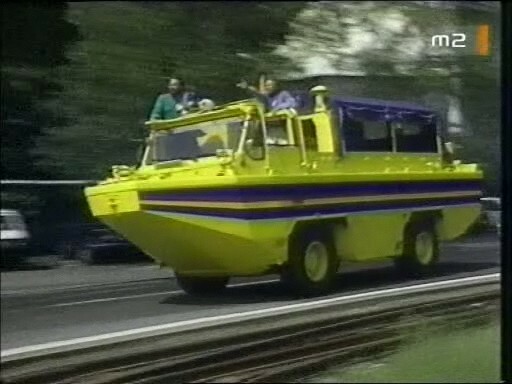 But the DUKW is a six-wheeler. They have more brands in Italy, why didn't use all of them, but "only" 3? Generally in case of trucks and buses the name Iveco was a successor of both - Fiats and Lancias (and some other makes - Italian and foreign), but how it was in case of such vehicles I don't know. 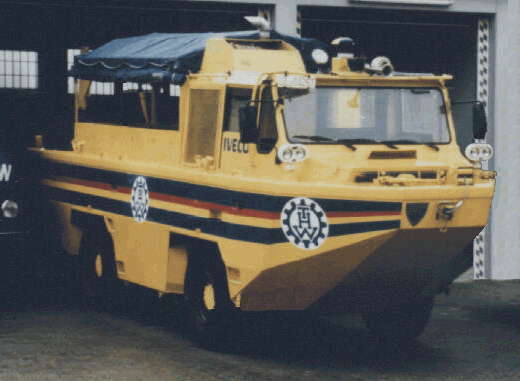 Listed variously as IVECO-Fiat, IVECO and IVECO-Lancia-Fiat on other websites; Jacque Cousteau took one up the Amazon in 1982; his is listed as an IVECO here on flickr, but tagged as a Fiat. I have this Cousteau mini series on video tape & will add it to the site soon.